… and Lydia lives and works in the heart of it. Selling luxurious purple in a Roman trade city, she watches the people struggle to preserve their decaying empire through devotion to pale, lifeless gods of stone and myth. Followers of The Way arrive and share with Lydia and the citizens of Philippi a powerful new message of love and redemption. Caught in the middle is Marcus, Lydia’s young cousin whom she raised as her own. Marcus searches for truth in a world of deceit. Seduced by the ways of Rome, he questions the promise of hope through Jesus of Nazareth. Can Lydia survive in this man’s world and help Marcus choose the correct path? Lydia holds a booth in the Philippi forum where she sells her purple fabric and dyes. She also holds a place of respect in Philippian society. When a group of travelers, led by Paul of Tarsus, land in the city’s center, Lydia opens her heart and home to their message of Jesus. She disregards her own safety or standing to provide them with a comfortable place to stay. Lydia struggles to overcome a culture that worships the gods of Olympus and find her own faith in the one true God of creation. Her greatest hope is to win the heart of her young cousin, Marcus, over to the Lord. The traveling preachers heal a young slave girl in the marketplace, rendering her useless as an oracle, and her owners, Ercole and Calchas, have them flogged and dragged to jail. When a devastating earthquake strikes, even the jailer takes notice of the men’s message of joy and perseverance and commits his family to their message of hope. 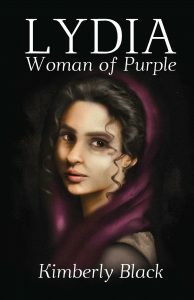 Lydia, Woman of Purple and Lydia, Woman of Purple Devotional Study Guide are available on amazon.com. Just click on the covers for the links! I had lost touch, and have been so anxious to read your Lydia story. I just ordered it on Amazon. I am even more excited now, as the one I have worked on for years is very, very different. I would love to see you, compare notes, and say hi. Please email me and maybe we can have lunch one day. I am so anxious to read the whole book! Hi Ingrid! I have thought about you often as I wrote. I hope that you enjoy the story. I would love to get together soon!